The Bru Jne & Cie company was located in France and manufactured some of the most beautiful and treasured bisque dolls that have ever been made. 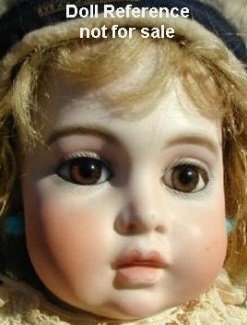 Dolls are commonly referred to as "Bru" dolls, but nothing about them is common. 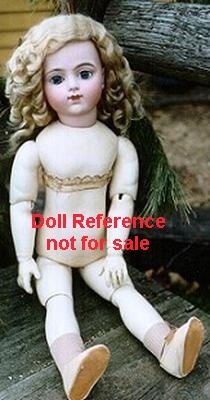 Want to make an antique doll collector faint, mention you bought a Bru doll for less than a few thousand dollars and have some smelling salts handy or they may think you are referring to, just a pair of shoes. There are three basic types of Bru dolls; Poupée de Mode or Lady Fashion Doll (literal translation is Doll of Fashion with a Lady body), Bébé Bru doll (literal translation is Bru doll) on a kid leather body and a Bru Doll with a wood and composition body. Some bisque heads were supplied to Bru Jne & Cie by Eugene Barrois. A Bru Oriental doll is usually marked Bru Jne. After 1899 Bru Jne et Cie became a member of the Society Française de Fabrication de Bébé & Jouets - SFBJ and continued to produce their Bru and Bébé dolls thru 1958. 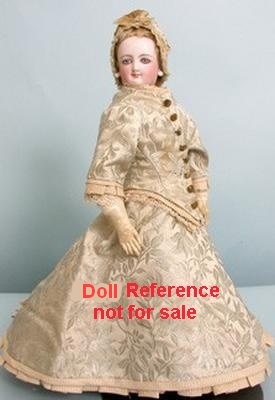 Because of the great value attached to Bru dolls, they are reproduced by modern artists more often than other antique dolls. 1866 + Bru Poupée de Mode, Doll of Fashion or Lady Fashion doll, 11-28" tall, bisque swivel shoulder plate head, kid leather, some gutta percha (rubber) jointed lady body, wig is human or mohair, can have painted or paperweight eyes, pierced ears, closed slight smiling mouth, some dolls are marked with a size number, a letter or B Jne ET Cie.
Doll shown is 16” tall, very rare smiling Bru, marked: letter E on head and E on shoulder plate. 1866 Bru Poupée de Mode, 16"
1868 + Bru Bébé Brevete´, Brevete = a marking that is a registered patent, Child doll, 11-28" tall, bisque socket head, kid leather body, bisque lower arms, skin wig, paperweight eyes, painted upper & lower lashes, feathered brows, pierced ears, closed mouth with space between lips, usually head marked with only a size number, body stamped: Bébé Brevete´ SGDG Paris. Bru Brevete Bébé shown is marked 0 size number. 1868 Bru Bébé Brevete 15"
1868+ Bru Circle Dot Bébé, 11-28" tall, bisque socket head, kid gusseted body with bisque lower arms but not jointed at the elbows, paperweight eyes, feathered brows, pierced ears, mohair wig, closed mouth with white space between lips, either a white or black doll. 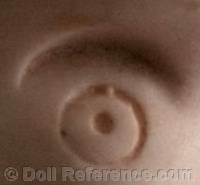 usually marked on head with a dot in a circle or crescent over a dot. 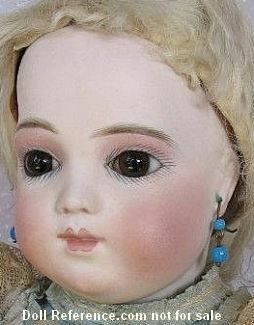 Doll shown is 21" tall, bisque swivel head on kid leather lined bisque shoulder plate and forearms, kid leather body, paperweight eyes, open/closed mouth with molded teeth, accented nostrils and eye corners, dimpled chin, pierced ears, human hair wig. 1868 Bru Circle Dot Bébé, 21"
1868 + Bru Bébé Jne, 11-36" tall, bisque socket head, kid body, kid over wood upper arms, hinged elbows, bisque lower arms, some have wooden legs, paperweight eyes with long lashes, pierced ears, closed mouth with white space between lips, usually marked on head: Bru Jne + size number and stamped on body: Bébé Bru and BTE SGDG. Doll shown is a size number 8 and is 21 1/2" tall. 1868 Bru Bébé Jne, 21 1/2"
ca. 1876-1929 Bru Bébé Teteur (Child or Baby Nursing Doll), 13 or 16" tall, bisque socket head, jointed kid leather or wood composition body, paperweight eyes, open nursing mouth with mechanism in head to take up liquids when key is turned, usually marked: Bru Jne N. T.
Doll shown is 13" tall is dated to ca. 1878-1899 and is appropriately dressed. 1876 Bru Bébé Teteur, 13"
ca. 1889-1899 Bru Bébé Jne R, 11 - 36" tall, bisque socket head, paperweight eyes, painted lashes, thick feathered brows, pierced ears, mohair wig, jointed wood and composition body, jointed wrists, pull-string crier mechanism, open or closed mouth with white space between lips (but no tongue), head marked: Bru Jne R with a size number, stamped on body: Bébé Bru. 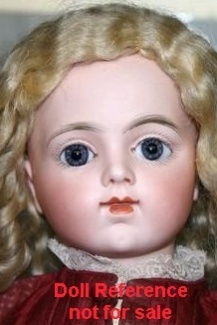 Doll shown is marked size number 2, is 13" tall, and has blue paperweight eyes, closed mouth with space between her lips and has jointed wrists. 1889 Bru Bébé Jne R, 13"